Summer around here is HOT! Hotter than usual this year and I'm looking forward to getting some relief. Rain has been very scarce as well. We've had some afternoon showers accompanied by thunder storms (which Dazy hates!) but not enough rain to keep the pond full. Oh well, it's good and deep. 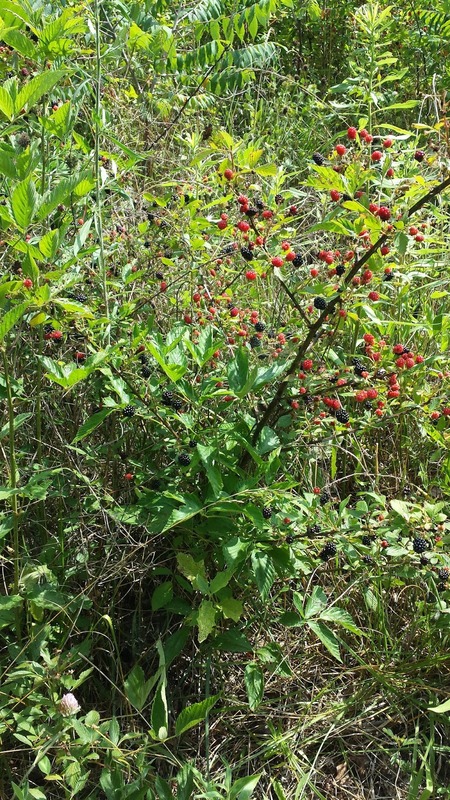 Wild blackberries are plentiful by the pond along with poison ivy and briars which I so seriously detest I have grudgingly succumbed to Roundup to get rid of some of it -- poison ivy and briars, not the berries. I was out there this morning spraying the stuff. I only use it sparingly and carefully and rarely in the orchard, just around the edges where nuisances occur. 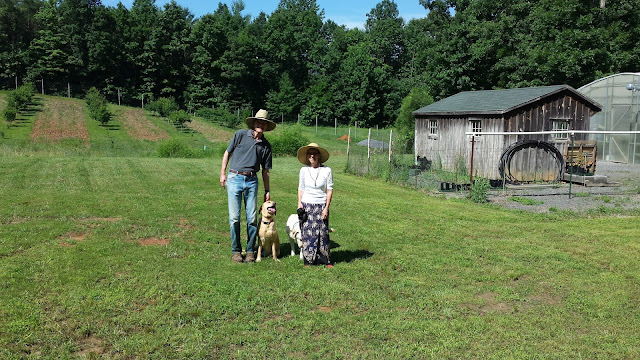 I visited John and Pat Martin and their 2 wonderful truffle dogs, golden labs with that sweet lab personality. Such good dogs. Of course, we had truffle sauce for our chicken. It's not every day I get to share my truffle juice with fellow trufflers. 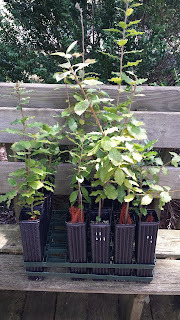 After a most enjoyable and informative week-end at Virginia Truffles, they gifted me with a baker's dozen Quercus Ilex (Holly Oaks) I won't be planting these guys until it cools off a bit. I'll just keep them watered and check their roots occasionally to make sure they aren't getting too crowded in their pots. I know they'd be much happier in the ground but, it's just too HOT and DRY for little ones. 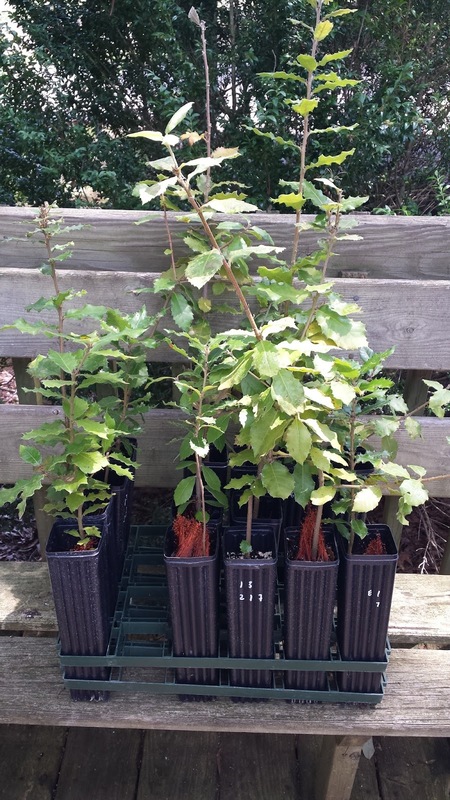 Aren't they pretty little trees? If you haven't been to Culpepper, Virginia, I highly recommend it for a week-end trip. Great shopping and restaurants and some very interesting and quaint places to stay and it's close to the Martins' place in Rixeyville. On July 12 from 1-5 PM, we will have the only free and open to the public tour at Keep Your Fork Farm for the year. It will be one of 5 farms in the Northern Triad Farm Tour for 2015. Please check it out and let me know if you're coming. I really like to connect with my readers in person. 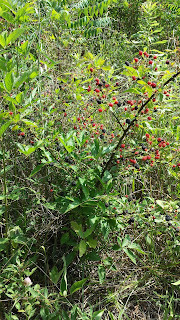 I do appreciate you all, With 36,000 views and counting, I'm wondering how many of you have ventured into your own plantings since the blog began. Don't forget to watch for Dazy and me in the August issue of Our State Magazine! Nice picture! Thanks for sharing this post..... I really enjoyed it. So glad you enjoyed the post. I will write and publish the fall info soon. As far as I know, the Asheville Truffle Experience is scheduled for February 21st week-end. I don't have any details at the present. I will blog about it and do a FB post when I know for certain what is expected. Thanks for your interest! !